It's been a while since we announced our intention to spend a week comparing a copy of n+1 and The Believer in a week-long face off. We thought some of you might want to know what's been going on since then. We've still been waiting for the arrival of the latest n+1. As of this morning, the website announces it is "en route to bookstores." Apparently, copies only arrived on Friday, so it will probably take some time for them get out west. It's worth noting, however, that within hours of my original post, a Believer editor dropped me a very friendly note, offering to send along the latest copy of The Believer. He described himself as "looking forward to Le Tour." A classy move, we thought, especially in light of our past criticisms of The Believer. * And yes, we know they do read us given how they flame us whenever they're criticized. More on that in Prologue. So, some time ago we made some snotty comments about n+1 and we were challenged in the comments box to back them up. The timing wasn't quite right but the announcement at the n+1 website that issue number four is about to go to press provides us with a sterling opportunity. We'd like to come back and give the magazine a fair shot on its own merits. But it seemed that merely critiquing it was, well, not that interesting, and besides we already do something like that (sometimes) with the LATBR. But we thought it was an opportunity to measure it side by side against The Believer, another publication we've been a tad snotty about in the past. (And yes, we acknowledge that our propensity for snottiness can land us into trouble.) The comparison seems to us a fairly obvious one - both are well-meaning enterprises, a bit earnest a times but essentially aiming to elevate the discourse, and both are run by editors who can be startlingly thin-skinned. (Monday) Prologue: Complete disclosure about any personal biases, followed by overall first impressions. (Tuesday) Stage 1: n+1 Long features v. Believer Long features. (Friday) Stage 4: Miscellany and a declaration of preference. We welcome the opportunity to challenge our own preconceptions and give both magazines a fair shot. 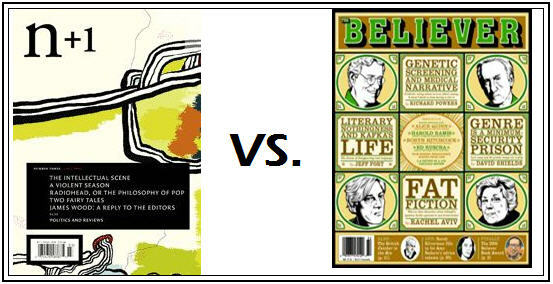 (The presence of a Believer book in our recommended sidebar should speak volumes about our capacity for objectivity.) We hope you'll be back for the fun, join the conversation and read along.